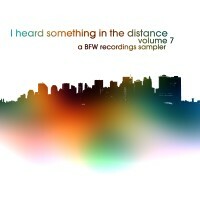 I Heard Something In The Distance volume 7 - a BFW Recordings sampler - Music is free! ambient, shoegaze, indie, experimental, electronica - independent netlabel sharing music with you for free! Original cover photograph by Fiona Burgin. Cover art by Bing Satellites. The seventh compilation from BFW recordings, featuring music from current and future BFW releases, from December 2010 to March 2011. This is probably the most ambient compilation we have released so far, although there are elements of indie guitar noise and glitchy electronics thrown in there for good measure. All in all, a great album showcasing the wide range of music we release - all available to download for free from BFW recordings.